Fresh green beans? Yes please! My Bountiful Basket last week had a bagful and it was all I could do not to eat them raw, perfect and crunchy. What did I do with my green beans instead of eat them as a snack (which is perfectly acceptable, of course!)? 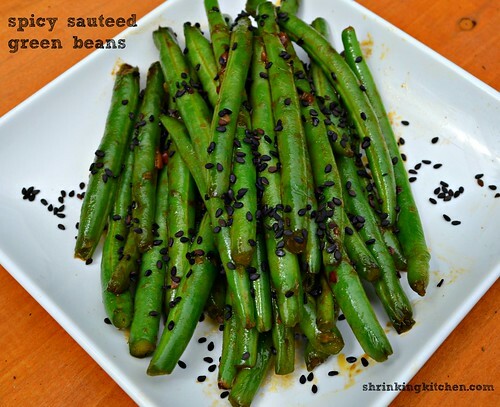 I made these Spicy Sauteed Green Beans! They are still wonderfully crunchy and delicious, but with a kick – the addition of a little olive oil, some garlic, pepper flakes, liquid aminos and a little low sodium vegetable broth take these green beans to the next level. By the way, if you’re wondering what in the heck is a liquid amino? You’re not alone! I just discovered them this year. What liquid aminos are is a condiment that is very similar in taste to soy sauce. It still contains soy, but is not fermented and contains no gluten. Also, you’ll get a little boost of amino acids – a little extra protein is an added bonus. Of course, you could totally substitute low sodium soy sauce or tamari in this recipe. 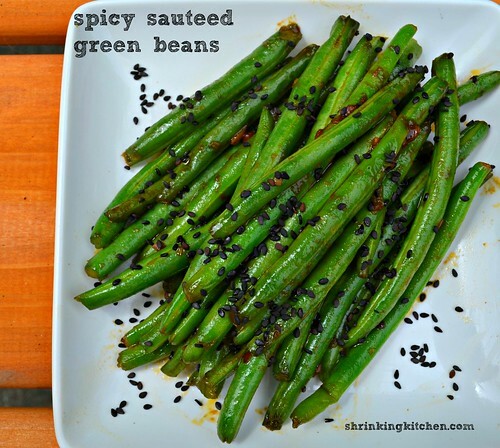 Top these green beans with some regular or black sesame seeds if you’re fancy. Then get them in your belly! Add the garlic and pepper flakes and cook a few seconds until fragrant, taking care not to burn the garlic. Throw the green beans in the pan and pour the water or broth over the top. Saute for about 5 minutes then add the liquid aminos. Continue cooking for a few minutes until the green beans are tender crisp and the broth/liquid aminos have reduced and are sticky. Remove to a serving dish and sprinkle with black sesame seeds, if desired.